More Details CUSHNIE Crewneck Silk Blouson-Sleeve Top Details Cushnie liquid cady top. Crew neckline. Chiffon, long blouson sleeves. Slim fit. Hidden back zip. Viscose/spandex. Combo, silk. Made in USA of imported materials. CUSHNIE Crewneck Silk Blouson-Sleeve Top Details Cushnie liquid cady top. Crew neckline. Chiffon, long blouson sleeves. Slim fit. Hidden back zip. Viscose/spandex. Combo, silk. Made in USA of imported materials. More Details Majestic Paris for Neiman Marcus Ally Soft Touch Long-Sleeve Crewneck Top Details Majestic Paris for Neiman Marcus "Ally" top. Crew neckline. Long sleeves. Slim silhouette. Pullover style. Viscose/spandex. Machine wash. Made in Portugal of French material. Majestic Paris for Neiman Marcus Ally Soft Touch Long-Sleeve Crewneck Top Details Majestic Paris for Neiman Marcus "Ally" top. Crew neckline. Long sleeves. Slim silhouette. Pullover style. Viscose/spandex. Machine wash. Made in Portugal of French material. 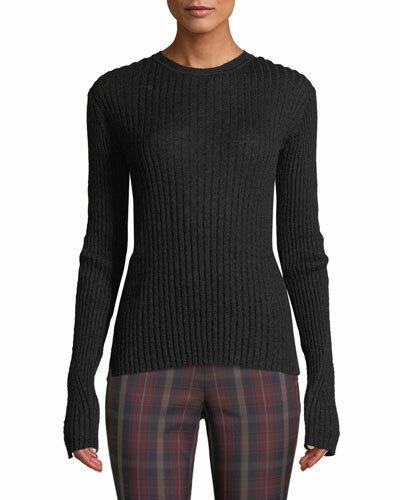 More Details Rag & Bone Donna Ribbed Crewneck Mohair Top Details Rag & Bone "Donna" rib-knit top. Crew neckline. Long sleeves. Slim fit. Pullover style. Mohair/nylon/wool. Dry clean. Imported. Rag & Bone Donna Ribbed Crewneck Mohair Top Details Rag & Bone "Donna" rib-knit top. Crew neckline. Long sleeves. Slim fit. Pullover style. Mohair/nylon/wool. Dry clean. Imported. More Details FRAME Panel Stripe Crewneck Long-Sleeve Top Details FRAME striped rib-knit top. Approx. 24"L down center back. Crew neckline. Long sleeves. Slim silhouette. Pullover style. Merino wool/acrylic. Dry clean. Imported. 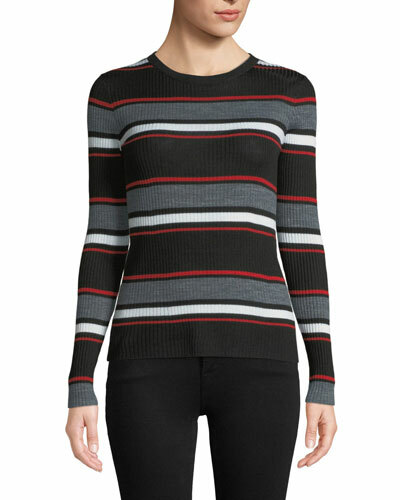 FRAME Panel Stripe Crewneck Long-Sleeve Top Details FRAME striped rib-knit top. Approx. 24"L down center back. Crew neckline. Long sleeves. Slim silhouette. Pullover style. Merino wool/acrylic. Dry clean. Imported. 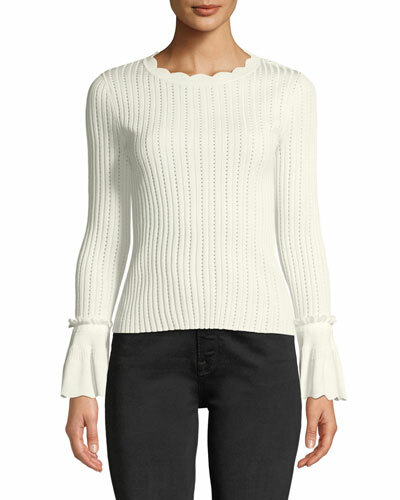 More Details Jonathan Simkhai Scalloped Ruffle Crewneck Top Details Jonathan Simkhai rib-knit top with scalloped neck & cuffs. Crew neckline. Long sleeves. Slim fit. Pullover style. Viscose/nylon. Imported. 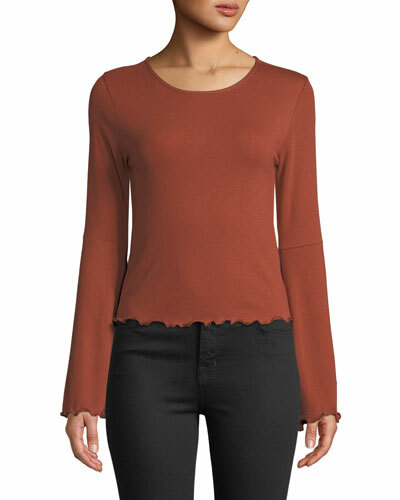 Jonathan Simkhai Scalloped Ruffle Crewneck Top Details Jonathan Simkhai rib-knit top with scalloped neck & cuffs. Crew neckline. Long sleeves. Slim fit. Pullover style. Viscose/nylon. Imported. More Details Rosetta Getty Crewneck Long-Sleeve Split-Apron Jersey Top Details Rosetta Getty mercerized cotton rib-jersey top. Crew neckline. Long sleeves. Slim fit. Apron wrap. High-low hem. Pullover style. Made in USA of imported materials. 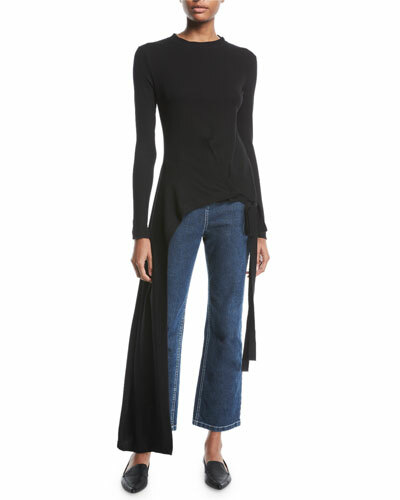 Rosetta Getty Crewneck Long-Sleeve Split-Apron Jersey Top Details Rosetta Getty mercerized cotton rib-jersey top. Crew neckline. Long sleeves. Slim fit. Apron wrap. High-low hem. Pullover style. Made in USA of imported materials. More Details Rebecca Taylor Emilia Crewneck Tie-Sleeve Floral-Print Top Details Rebecca Taylor "Emilia" floral-print top. Crew neckline. Short, tie sleeves. Slim fit. Slipover style. Keyhole back. Silk/viscose. Imported. Rebecca Taylor Emilia Crewneck Tie-Sleeve Floral-Print Top Details Rebecca Taylor "Emilia" floral-print top. Crew neckline. Short, tie sleeves. Slim fit. Slipover style. Keyhole back. Silk/viscose. Imported. More Details Bailey 44 Celebration Sequined Crewneck T-Shirt Details Bailey 44 "Celebration" sequined T-shirt. Crew neckline. Short sleeves. Slim silhouette. Hidden back zip. Nylon/spandex. Made in USA. Bailey 44 Celebration Sequined Crewneck T-Shirt Details Bailey 44 "Celebration" sequined T-shirt. Crew neckline. Short sleeves. Slim silhouette. Hidden back zip. Nylon/spandex. Made in USA. 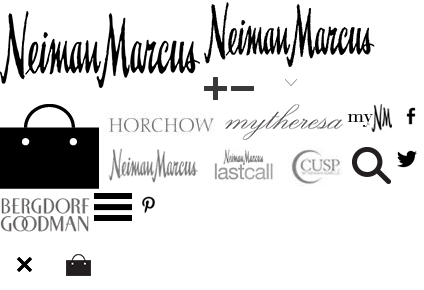 More Details Majestic Paris for Neiman Marcus Cathy Crewneck Cotton-Cashmere Top Details Majestic Paris for Neiman Marcus "Cathy" T-shirt. Crew neckline. Long sleeves. Slim fit. Pullover style. Cotton/cashmere. Hand wash. Imported of French materials. Majestic Paris for Neiman Marcus Cathy Crewneck Cotton-Cashmere Top Details Majestic Paris for Neiman Marcus "Cathy" T-shirt. Crew neckline. Long sleeves. Slim fit. Pullover style. Cotton/cashmere. Hand wash. Imported of French materials. 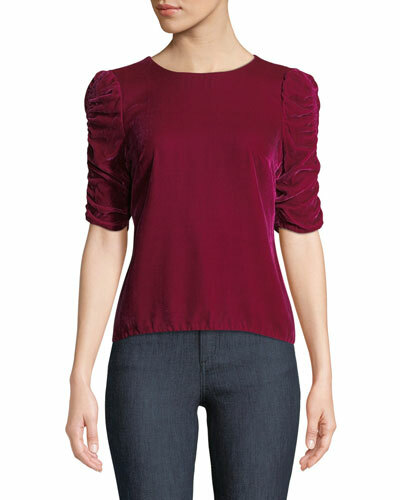 More Details Rebecca Taylor Velvet Ruched-Sleeve Crewneck Top Details Rebecca Taylor velvet top with ruched sleeves. Crew neckline. Short sleeves. Slim fit. Slightly cropped. Keyhole back. Slipover style. Silk/rayon. Imported. 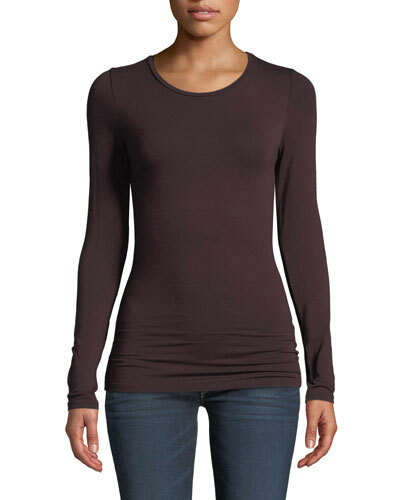 Rebecca Taylor Velvet Ruched-Sleeve Crewneck Top Details Rebecca Taylor velvet top with ruched sleeves. Crew neckline. Short sleeves. Slim fit. Slightly cropped. Keyhole back. Slipover style. Silk/rayon. Imported. More Details Helmut Lang Jacquard Long-Sleeve Crewneck Top Details Helmut Lang double-knit top featuring tonal jacquard detailing. Ribbed crew neckline. Long sleeves. Slim silhouette. Pullover style. Viscose/nylon. Dry clean. Imported. Helmut Lang Jacquard Long-Sleeve Crewneck Top Details Helmut Lang double-knit top featuring tonal jacquard detailing. Ribbed crew neckline. Long sleeves. Slim silhouette. Pullover style. Viscose/nylon. Dry clean. Imported. More Details Rosetta Getty Crewneck Balloon-Sleeve Cotton Poplin Top Details Rosetta Getty cotton poplin top. Crew neckline. Short, balloon sleeves. Slim silhouette. Hidden back zip. Dry clean. Made in USA of Italian materials. 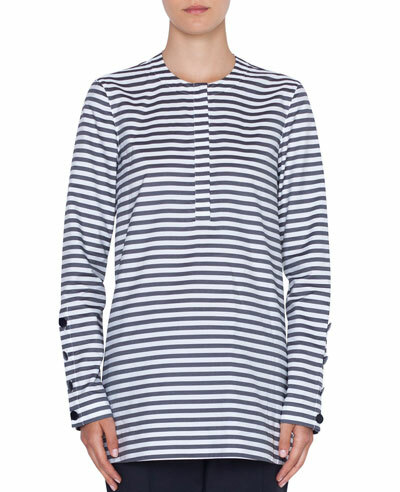 Rosetta Getty Crewneck Balloon-Sleeve Cotton Poplin Top Details Rosetta Getty cotton poplin top. Crew neckline. Short, balloon sleeves. Slim silhouette. Hidden back zip. Dry clean. Made in USA of Italian materials. More Details Cupcakes and Cashmere Kamala Lettuce-Edge Crewneck Top Details Cupcakes and Cashmere "Kamala" top with lettuce-edges. Crew neckline. Long sleeves. Slim silhouette. Pullover style. Polyester/rayon/spandex. Imported. Cupcakes and Cashmere Kamala Lettuce-Edge Crewneck Top Details Cupcakes and Cashmere "Kamala" top with lettuce-edges. Crew neckline. Long sleeves. Slim silhouette. Pullover style. Polyester/rayon/spandex. Imported. 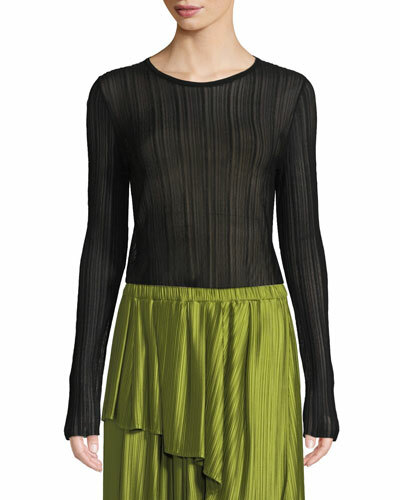 More Details Proenza Schouler PSWL Short-Sleeve Knit Lightweight Crewneck Top Details Proenza Schouler PSWL lightweight ribbed top. Crew neckline; logo print. Short sleeves. Slim fit. Pullover style. Cotton/polyester/nylon/spandex. Imported. 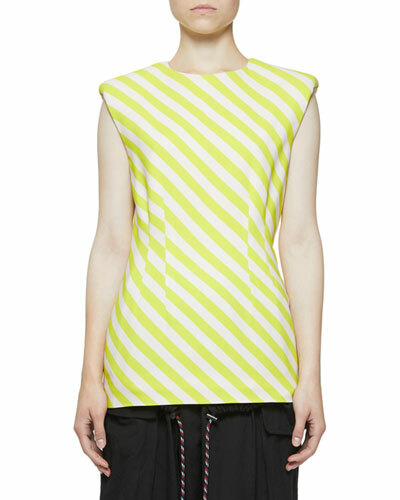 Proenza Schouler PSWL Short-Sleeve Knit Lightweight Crewneck Top Details Proenza Schouler PSWL lightweight ribbed top. Crew neckline; logo print. Short sleeves. Slim fit. Pullover style. Cotton/polyester/nylon/spandex. Imported. More Details CUSHNIE Arizona Cropped Crewneck Top w/ Zipper Details Cushnie Et Ochs "Arizona" top with wraparound zipper. Crew neckline. Long sleeves. Slim fit. Cropped hem. Pullover style. Polyester/spandex. Made in USA of imported material. 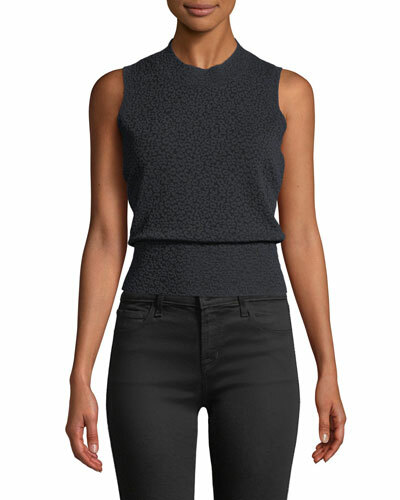 CUSHNIE Arizona Cropped Crewneck Top w/ Zipper Details Cushnie Et Ochs "Arizona" top with wraparound zipper. Crew neckline. Long sleeves. Slim fit. Cropped hem. Pullover style. Polyester/spandex. Made in USA of imported material. More Details Brunello Cucinelli Crewneck Short-Sleeve Silk Top with Feathers Details Brunello Cucinelli silk top with ostrich feather trim at shoulders. Crew neckline. Short sleeves. Slim silhouette. Slipover style. Lining, nylon. Made in Italy. 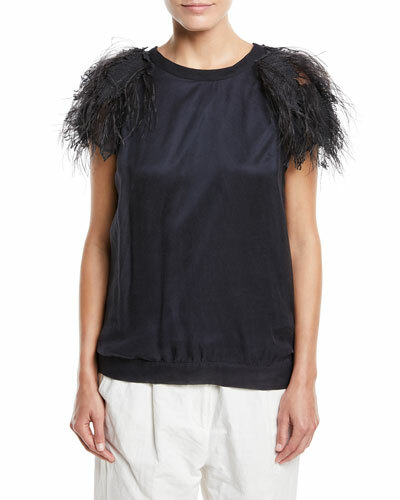 Brunello Cucinelli Crewneck Short-Sleeve Silk Top with Feathers Details Brunello Cucinelli silk top with ostrich feather trim at shoulders. Crew neckline. Short sleeves. Slim silhouette. Slipover style. Lining, nylon. Made in Italy. 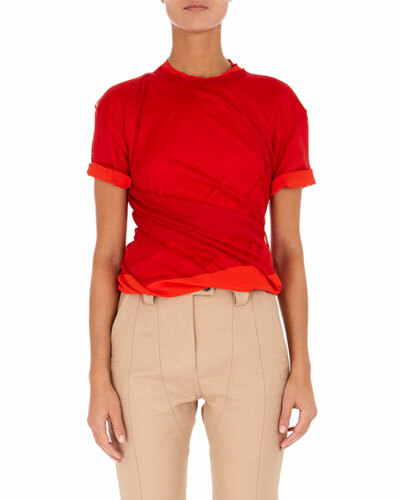 More Details Escada Crewneck Short-Sleeve Sponge-Cashmere Top Details Escada sponge cashmere top. Crew neckline. Short sleeves. Slim fit. Pullover style. Imported of Italian materials. 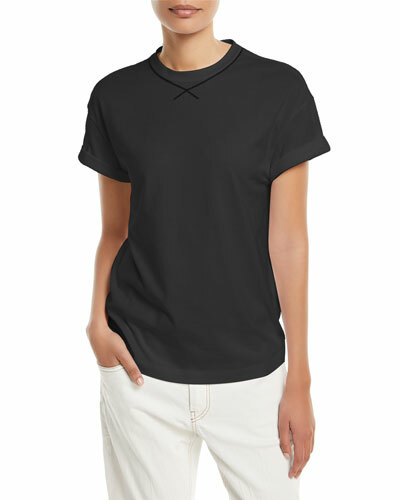 Escada Crewneck Short-Sleeve Sponge-Cashmere Top Details Escada sponge cashmere top. Crew neckline. Short sleeves. Slim fit. Pullover style. Imported of Italian materials. More Details Lafayette 148 New York 3/4-Sleeve Swiss Stretch-Cotton Crewneck Top Details Lafayette 148 New York Swiss stretch-cotton top. Crew neckline. Three-quarter sleeves. Slim fit. Pullover style. Cotton/spandex. Machine wash. Imported of Swiss material. Lafayette 148 New York 3/4-Sleeve Swiss Stretch-Cotton Crewneck Top Details Lafayette 148 New York Swiss stretch-cotton top. Crew neckline. Three-quarter sleeves. Slim fit. Pullover style. Cotton/spandex. Machine wash. Imported of Swiss material. More Details Rosetta Getty Reverse-Seam Crewneck Long-Sleeve Cotton Rib Jersey Top Details Rosetta Getty top in mercerized cotton rib jersey. Reverse seam details. Crew neckline. Long sleeves. Slim fit. Pullover style. Dry clean. Made in USA of imported materials. Rosetta Getty Reverse-Seam Crewneck Long-Sleeve Cotton Rib Jersey Top Details Rosetta Getty top in mercerized cotton rib jersey. Reverse seam details. Crew neckline. Long sleeves. Slim fit. Pullover style. Dry clean. Made in USA of imported materials. More Details Christian Wijnants Kiril Plisse Crewneck Long-Sleeve Top Details Christian Wijnants "Kiril" sheer plisse top. Crew neckline. Long sleeves. Slim silhouette. Slipover style Viscose/nylon. Hand wash. Imported. 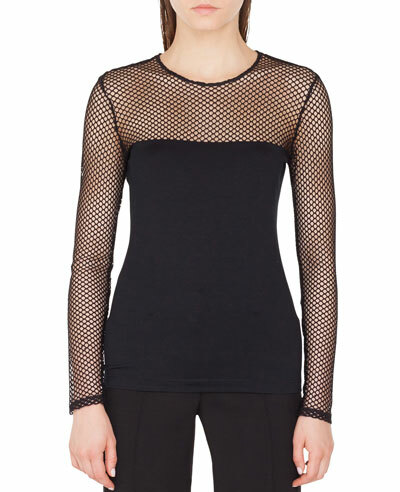 Christian Wijnants Kiril Plisse Crewneck Long-Sleeve Top Details Christian Wijnants "Kiril" sheer plisse top. Crew neckline. Long sleeves. Slim silhouette. Slipover style Viscose/nylon. Hand wash. Imported. More Details Versace Crewneck Long-Sleeve Ribbed-Knit Top w/ Button Detail Details Versace ribbed-knit top with button detail at sides. Crew neckline. Long sleeves. Slim fit. Pullover style. Wool. Made in Italy. 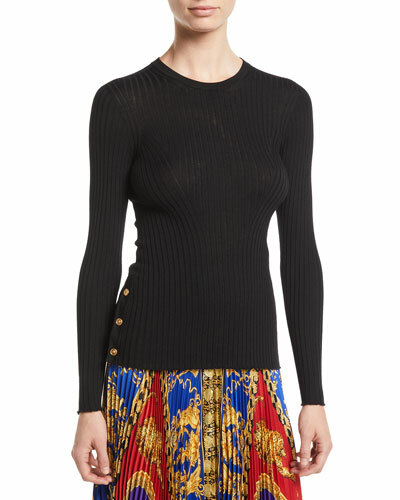 Versace Crewneck Long-Sleeve Ribbed-Knit Top w/ Button Detail Details Versace ribbed-knit top with button detail at sides. Crew neckline. Long sleeves. Slim fit. Pullover style. Wool. Made in Italy. More Details Rosetta Getty Wrap-Back Crewneck Sleeveless Stretch-Suede Top Details Rosetta Getty top in lambskin suede with stretch. Wrap back detail. Crew neckline. Sleeveless. Slim fit. Backing, cotton/spandex. Dry clean only. Made in USA of French materials. Rosetta Getty Wrap-Back Crewneck Sleeveless Stretch-Suede Top Details Rosetta Getty top in lambskin suede with stretch. Wrap back detail. Crew neckline. Sleeveless. Slim fit. Backing, cotton/spandex. Dry clean only. Made in USA of French materials. 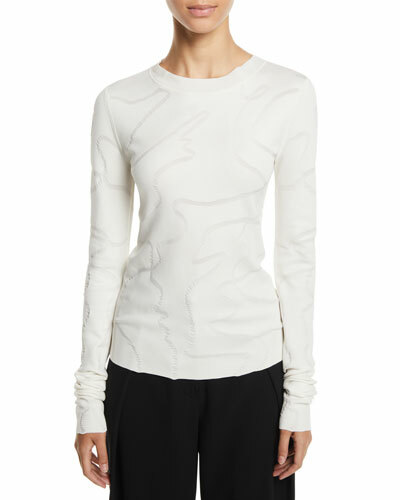 More Details Helmut Lang Split-Neck Long-Sleeve Cotton Thermal Top Details Helmut Lang thermal knit cotton top. Split neckline. Long sleeves. Slim silhouette. Pullover style. Seam detail at back. Raw-cut hem. Imported. 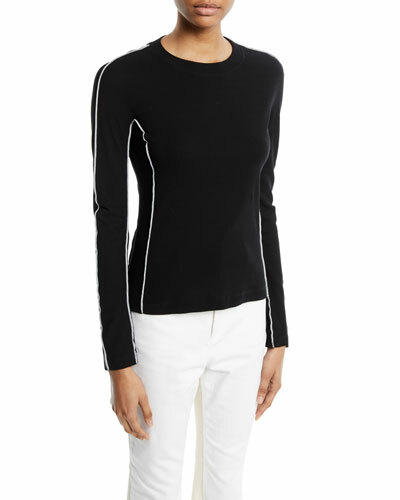 Helmut Lang Split-Neck Long-Sleeve Cotton Thermal Top Details Helmut Lang thermal knit cotton top. Split neckline. Long sleeves. Slim silhouette. Pullover style. Seam detail at back. Raw-cut hem. Imported. More Details Helmut Lang Satin Crewneck Cap-Sleeve Tee Details Helmut Lang satin tee. Crew neckline; keyhole back. Cap sleeves. Slim fit. Slipover style. Curved hem. Viscose. Imported. 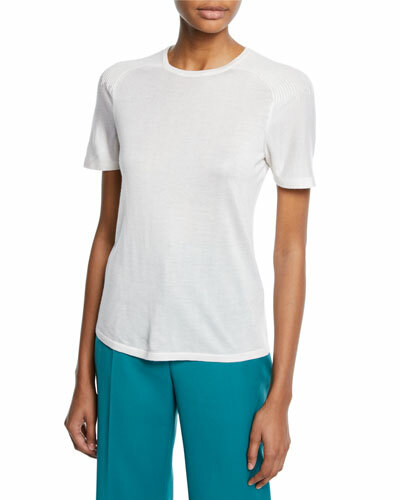 Helmut Lang Satin Crewneck Cap-Sleeve Tee Details Helmut Lang satin tee. Crew neckline; keyhole back. Cap sleeves. Slim fit. Slipover style. Curved hem. Viscose. Imported. More Details Rosetta Getty Scarf-Neck Sleeveless Crepe Back Satin Top Details Rosetta Getty crepe-back satin top. Convertible scarf neck. Sleeveless. Slim fit. Slipover style. Acetate/wool/viscose. Made in USA of Italian materials. 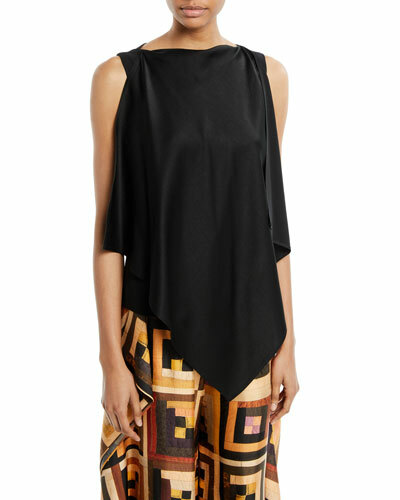 Rosetta Getty Scarf-Neck Sleeveless Crepe Back Satin Top Details Rosetta Getty crepe-back satin top. Convertible scarf neck. Sleeveless. Slim fit. Slipover style. Acetate/wool/viscose. Made in USA of Italian materials. 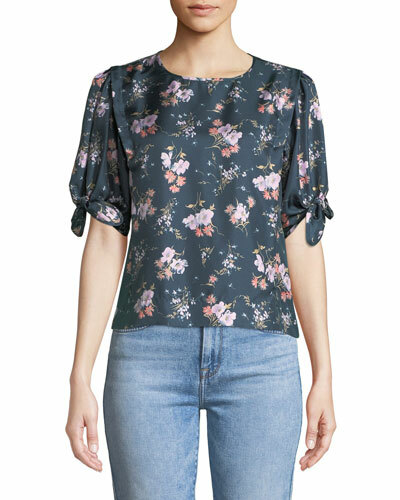 More Details Michael Kors Collection Round-Neck Bell-Sleeve Floral-Lace Top Details Michael Kors Collection floral-lace top. Round neckline. Long, bell sleeves. Hidden back zip. Slim silhouette. Nylon/rayon/spandex. Imported of Italian materials. 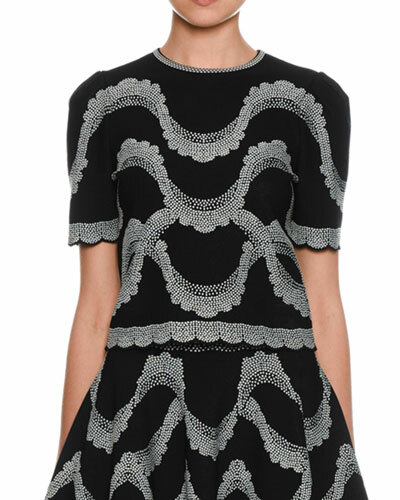 Michael Kors Collection Round-Neck Bell-Sleeve Floral-Lace Top Details Michael Kors Collection floral-lace top. Round neckline. Long, bell sleeves. Hidden back zip. Slim silhouette. Nylon/rayon/spandex. Imported of Italian materials. 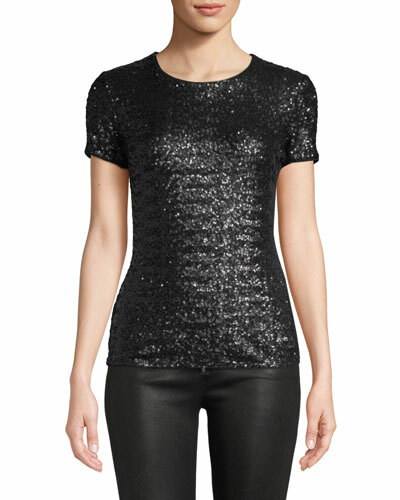 More Details Naeem Khan Jewel-Neck Long-Sleeve Sequined Lace Blouse Details Naeem Khan sequined lace blouse. Jewel neckline. Long sleeves. Slim fit. Keyhole back. Scalloped hem. Nylon; lining, silk. Made in USA of imported materials. 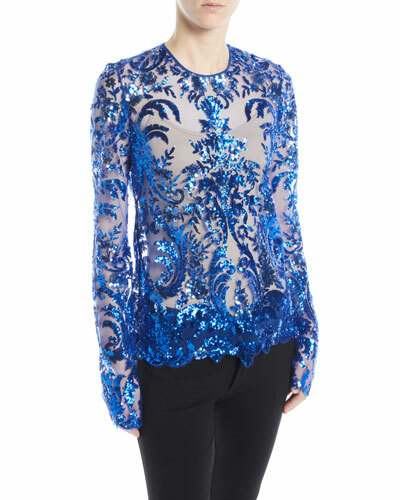 Naeem Khan Jewel-Neck Long-Sleeve Sequined Lace Blouse Details Naeem Khan sequined lace blouse. Jewel neckline. Long sleeves. Slim fit. Keyhole back. Scalloped hem. Nylon; lining, silk. Made in USA of imported materials. More Details Emporio Armani Round-Neck Long-Sleeve Lattice-Jacquard Knit Top Details Emporio Armani lattice-jacquard knit top. Round neckline. Long sleeves. Slim fit. Pullover style. Polyester/spandex. Imported. 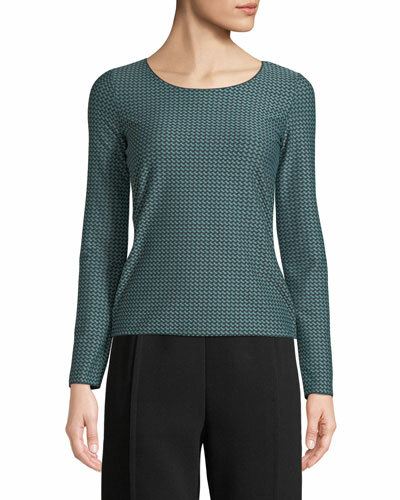 Emporio Armani Round-Neck Long-Sleeve Lattice-Jacquard Knit Top Details Emporio Armani lattice-jacquard knit top. Round neckline. Long sleeves. Slim fit. Pullover style. Polyester/spandex. Imported. 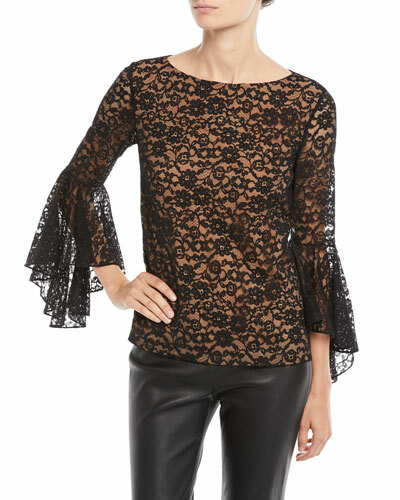 More Details Ermanno Scervino Pashmina Lace-Inset Tie-Neck Top Details Ermanno Scervino pashmina top with delicate lace insets. Scalloped eyelash-lace neckline and hem. V neckline with self-tie strings. Sleeveless. Slim silhouette. Slipover style. Wool/silk/cashmere/cotton/nylon. Lace, cotton/nylon. Made in Italy. Ermanno Scervino Pashmina Lace-Inset Tie-Neck Top Details Ermanno Scervino pashmina top with delicate lace insets. Scalloped eyelash-lace neckline and hem. V neckline with self-tie strings. Sleeveless. Slim silhouette. Slipover style. Wool/silk/cashmere/cotton/nylon. Lace, cotton/nylon. Made in Italy. More Details Theory Novelty Crewneck Prosecco Pointelle Shell Top Details Theory "Novelty" shell in Prosecco pointelle. Crew neckline. Sleeveless. Slim fit. Pullover style. Hip-length. Viscose/polyester. Dry clean. Imported of Italian materials. Theory Novelty Crewneck Prosecco Pointelle Shell Top Details Theory "Novelty" shell in Prosecco pointelle. Crew neckline. Sleeveless. Slim fit. Pullover style. Hip-length. Viscose/polyester. Dry clean. Imported of Italian materials. More Details Rag & Bone Raina Slim Ribbed Crewneck Tank Top Details Rag & Bone "Raina" ribbed tank top. Crew neckline. Sleeveless. Fitted silhouette. Pullover style. Polyester/viscose/metallic fiber; trim, viscose. Dry clean. Imported. 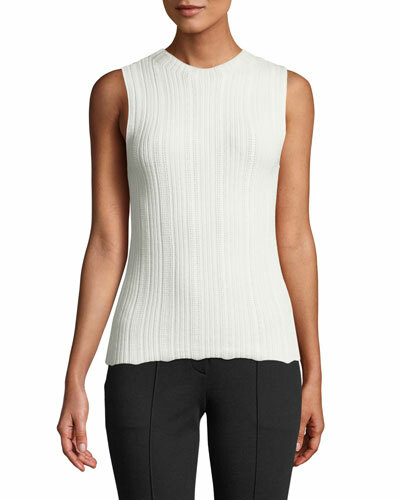 Rag & Bone Raina Slim Ribbed Crewneck Tank Top Details Rag & Bone "Raina" ribbed tank top. Crew neckline. Sleeveless. Fitted silhouette. Pullover style. Polyester/viscose/metallic fiber; trim, viscose. Dry clean. Imported. More Details THE ROW Riddi Crewneck Long-Sleeve Top Details The Row "Riddi" top. Crew neckline. Long sleeves. Slim fit. Pullover style. Silk/nylon/spandex. Made in Italy. THE ROW Riddi Crewneck Long-Sleeve Top Details The Row "Riddi" top. Crew neckline. Long sleeves. Slim fit. Pullover style. Silk/nylon/spandex. Made in Italy. 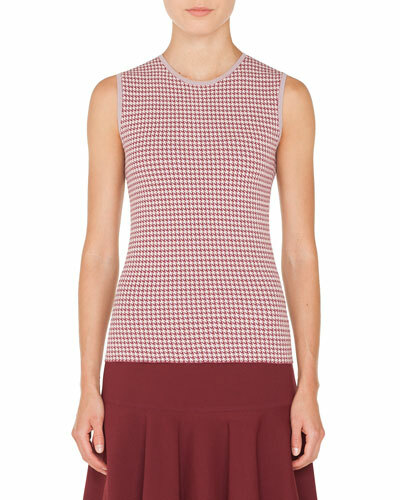 More Details Gabriela Hearst Bravo Crewneck Short-Sleeve Cashmere-Silk Knit Top Details Gabriela Hearst "Bravo" knit top. Crew neckline. Short sleeves. Slim fit. Pullover style. Cashmere/silk. Imported. 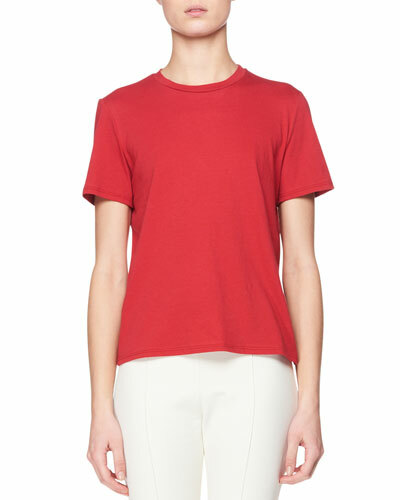 Gabriela Hearst Bravo Crewneck Short-Sleeve Cashmere-Silk Knit Top Details Gabriela Hearst "Bravo" knit top. Crew neckline. Short sleeves. Slim fit. Pullover style. Cashmere/silk. Imported. More Details Theory Crewneck Leopard-Print Shell Top Details EXCLUSIVELY AT NEIMAN MARCUS Theory shell in leopard-print. Crew neckline. Sleeveless. Slim silhouette. Slipover style. Rayon/nylon. Imported. 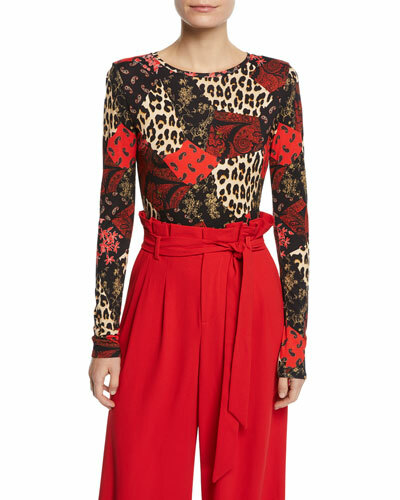 Theory Crewneck Leopard-Print Shell Top Details EXCLUSIVELY AT NEIMAN MARCUS Theory shell in leopard-print. Crew neckline. Sleeveless. Slim silhouette. Slipover style. Rayon/nylon. Imported.